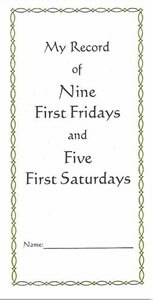 The promises attached to making the nine First Fridays and five First Saturdays would be almost incredible if they had not come from heaven itself. This convenient leaflet will help you keep track to ensure that they have been properly made. Requirements and a place to check each month.